Could This Be Scabies Recurring In A New Way? I have been breaking out with what looks like a pimple on my legs for about 2 weeks now. They don't itch right away. The first sign I have is just feeling the bump while washing or putting lotion on. I have picked at some and not at others but after about 12 to 24 hours after I discover them they will itch for awhile. Some itch for just minutes and seem to go away quickly and others will stay for a couple of days and itch periodically. The pimple like bumps are not close together, several inches at least. When they are going away, they are dry and hard. I can't see that there are any lines, or burrows around the bump. I did have scabies about a year and a half ago. This doesn't seem to be quite the same, but I can't figure out what else it could be. By the way, I haven't changed the products I use for cleaning or bathing and almost everything I use is either "free" or sensitive skin. Of course, the politically correct thing to say is "see a doctor," but that is completely your decision. I'm the type that uses doctors as a last resort when I've tried all the natural remedies first. Your skin condition doesn't really sound like scabies to me. 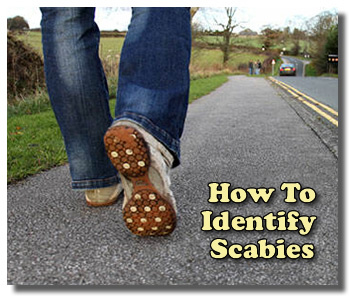 The bumps of scabies seem to usually form a trail, though not always. The rash is usually extremely itchy and takes a long time to go away. That doesn't mean it isn't some other type of skin parasite though. It may also be a build up of some toxins in your system that are being released through these pimple like bumps on your skin. Hard to say for sure. There are a couple of natural treatments you can try to help clear up the problem. Inside: Use a natural internal herbal cleanse, like Para 90 or Herbal Fiberblend. They both contain anti-parasitic and anti-fungal herbs that will help kill any parasites and get them out of your system as well as detoxify your body. Outside: There are a number of topical essential oils that are often helpful in treating skin parasites. You can try tea tree oil, oregano oil, or clove oil, to name a few. Usually, when we have a skin condition, it is the result of something not right internally. A good cleanse is always in order. Also, boosting your immune system by taking probiotics and anti-oxidants daily is important too. I hope those tips help you find some healing and relief.